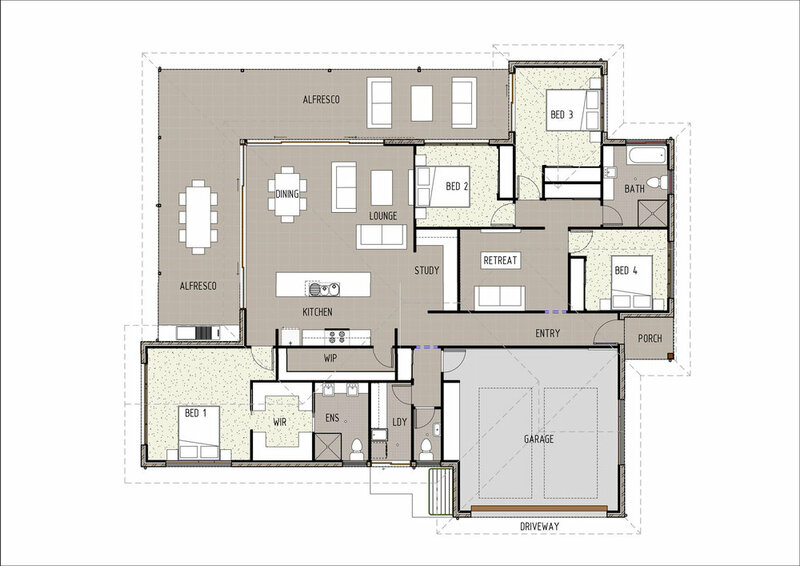 This four bedroom floor plan is well designed with family living in mind. Upon entering the home you have a separate children's wing of the home immediately to your right. This wing consists of three bedrooms, a full size bathroom, storage cupboard and kids retreat/t.v room and is fabulous for letting parents have a break from the children or for early morning risers. Further into the home you will find an open plan kitchen, dining and living area with a good sized open study nook off to the side. The kitchen features an island bench and huge walk in pantry. At the rear of the home is the master bedroom which includes a walk in wardrobe and private ensuite. Extra features of the home include a guest powder room, internal laundry, additional storage in the garage and the massive wrap around outdoor alfresco with access from the whole kitchen, dining and lounge area. With wall to wall glass sliding doors, the alfresco allows a maximum amount of natural light to pour into the home.